The outcomes of two recent pedestrian accidents in Maine illustrate just how fragile life is – especially when negligence factors in. A 51-year old Skowhegan woman was struck and killed last week when she reportedly walked into incoming traffic at an intersection. Authorities are uncertain why Kathy Barker would have crossed the intersection at Constitution and Madison avenues during a green light, but they don’t suspect her actions were suicidal in nature. Barker was hit by a pickup truck driven by Jason Carrigan just after 8:00 PM, say authorities. Just behind Carrigan’s truck was an EMT vehicle, but despite immediate attempts to treat the woman’s injuries, she was later pronounced dead after being transported to Redington-Fairview General Hospital. “Any intersection is dangerous if people don’t adhere to signage and things like that,” said local Police Chief Don Bolduc. “It’s important people are not wearing dark clothes and all those things we’ve talked about before about safety.” Bolduc continues to investigate the accident, but excessive speed and alcohol are not suspected. In a separate incident last week, a Bethel man has been arrested for leaving the scene of a hit-and-run accident that left a teenager in critical condition. Forty-five year old Richard Marin was arrested by authorities and is being held on $10,000 bail at Oxford County Jail. According to officials, Marin was driving his vehicle when he hit the teenager while he was riding his bike on Church Street. The impact left the boy, who is from New Hampshire, with life-threatening injuries. He is being treated at Portland’s Maine Medical Center, where he’s still in critical condition. Marin was finally located and ID’d after the sheriff’s office received tips that directed them to a Bethel garage, where they discovered a vehicle that perfectly matched the descriptions given by eyewitnesses. 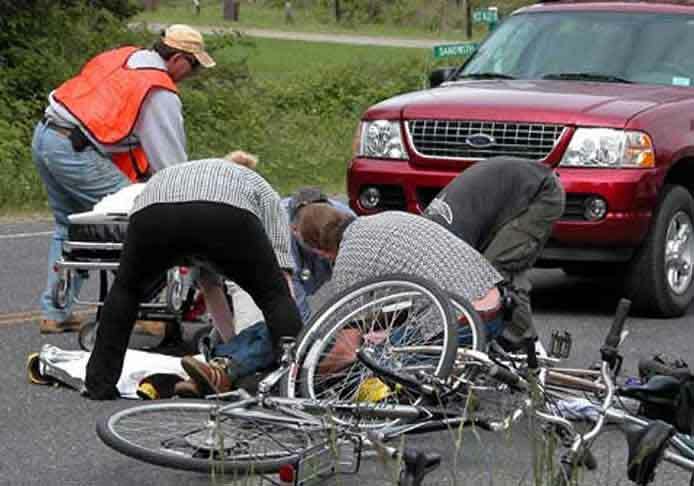 Cyclists and pedestrians alike are at great risk for suffering significant bodily harm when struck by motor vehicles. Paralysis, broken bones, internal injuries, traumatic brain injury and death are not uncommon outcomes in pedestrian-auto accidents. According to the National Highway Safety Association (NHTSA), an estimated 5,000 pedestrians die in motor vehicle accidents every year, and another 76,000 pedestrians suffer massive injuries. But who is to blame for these accidents and how do you establish liability? However, a bicyclist or pedestrian may attempt to recover compensation for injuries sustained if it’s evident that a third party’s negligence contributed to the accident. When demonstrating negligence in an accident, the plaintiff and his or her attorney must prove that the defendant breached their duty by driving too fast, while intoxicated, failing to signal, disobeying traffic signals, or driving while distracted. If you or a loved one was harmed in a pedestrian-car accident and would like an experienced attorney to evaluate your claim, call 1-800-INJURED to speak with a Maine accident lawyer at Hardy, Wolf & Downing. We advocate on behalf of victims in the Portland, Lewiston and Bangor areas.